Take your cell phone from standard to stunning in under an hour with a custom and easy-to-make DIY Phone Case (FULL TUTORIAL on how to make a phone case). You have never been one to “follow the crowd.” Growing up, your mortal fear was to show up at the same place, at the same time, with the same outfit as someone else. You have always looked to put your own stamp on things…be your own person. Currently at the moment, you find yourself at a big lunch where everyone has their cell phone on the table, in case the office calls or the babysitter texts, etc., etc. You realize very quickly that if it wasn’t for the seating configuration, you would have no idea which phone is yours. Everyone’s phone looks exactly the same! Suddenly, all of those fears from high school come flooding back. You immediately make a mental note to break out of the conformity. 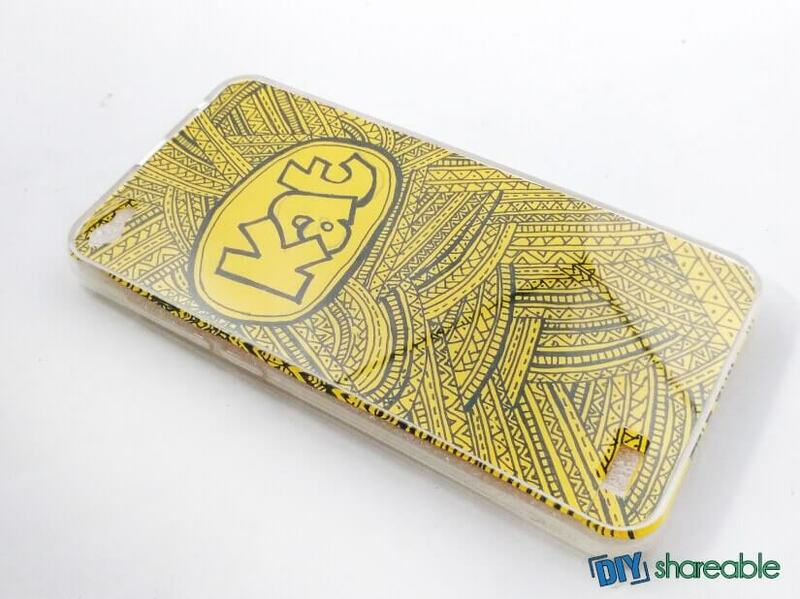 You will create your very own DIY phone case – one that will be a total reflection of you. Sure you can individualize with a stock phone case from the store but once again – is that really a reflection of you? What are your options for a personalized phone case that won’t break the budget? We’re going to show you how to take a transparent phone case and make it a completely individualized piece you’ll love. If you’re an artist or even just a doodler, now will be your time to shine and let everyone know what your style is. No longer will you be just one of the crowd. Your phone is going to be as unique as you are. We can guarantee that this phone case will make sure your phone is truly one of a kind. The great thing about this project is that apart from the transparent phone case, you should already have everything you need in order to complete the project at home. Affordable projects are the best kind, as they keep you inspired without breaking the bank. Once you get the hang of it you can make additional cases for yourself, family and friends. Who knows – you might become a phone case entrepreneur! Are you ready to take your cell phone from boring to bangin’? Step 1. Prepare your materials. If you prefer, you can certainly just use plain copy paper. Make sure your paper choice isn’t glossy as the ink will bleed. Thicker paper – like scrap-booking paper – will work best and won’t absorb the ink. It usually also comes in great colors and textures as well. Pro Tip – Many dollar stores now carry packs of scrap-booking paper! These mini sheets are just right for creating these mini masterpieces! Step 2. Remove the packaging materials that came with the case. Discard the protective foam but reserve the cardboard piece that was included inside. Your cardboard inset will be used as a guide for tracing the decorated paper you’ll be placing inside the phone case. Do not use the phone case itself as the paper will be too large to lay inside then. Step 3. Using a pencil, lightly trace around the cardboard inset. Step 4. Now you can use the actual phone case to trace where the holes are for the camera, speakers, and any other features you might be covering up. Step 5. Now that you’ve traced out your guide lines, it’s time to cut it out. Cut carefully. The paper you just cut should fit perfectly inside of the clear phone case. Step 6. You want everyone to see the stunning design you’re about to create so flip your paper over so the back side is now facing up. Step 7. Now is the time to customize. Here is what I did below for my case. Of course, my ideas are only a suggestion – you can create whatever drawing or designs you like! Using a pencil, draw the letters of your name in the center. Make sure the letters are outline style and don’t draw them too big. They should be connected or overlapping. Don’t worry about perfect uniformity here. Part of making DIY projects is allowing them to look and feel handmade. Only machines are perfect! Decide what style you’d like. Bubble letters, graffiti or an open script would all look great. Step 8. Trace along the lines you made with pencil to thicken your outline. Now follow up with your pen or fine line permanent marker outlining your whole name. Step 9. Once you are finished with all the letters, draw a circle around your name. Again, it does not have to be perfect and it should only be a single thin line. Step 10. Make a second circle but this time make it thicker and more defined than the first. Step 11. Now it’s time to fill in the entire page using random designs. If you’re familiar with adult coloring books, you’re aiming to create designs similar to the ones used there. Once again, this is only a suggestion. If you prefer a drawing that covers your entire case – stickers, squiggles, or cats and dogs – the choice is yours. This case is about you, so design what you love! Step 12. If you’re going with a coloring book type design make sure you alternate the patterns along with the directions you are drawing them in. Make sure that no similar pattern are drawn beside each other, but it is okay for them to intersect or overlap. Step 13.Continue drawing the patterns until you have filled the entire paper. Step 14. Once the paper is completely covered with your line patterns, it should look like this. Lightly erase the lines you made with the pencil. Be very gentle, you don’t to end up erasing the ink as well. Pro Tip: Using a composite eraser for charcoal can help protect your paper and designs. Make sure the ink is dry if you have used a gel pen. Step 15.Lay your paper with the design facing out in the bottom of the transparent case. Step 16. Now you can put the DIY case around your phone and start showing it off. With as much as we use our phones, they really should be customized to match who we are and what we like. Remember you aren’t limited to the ideas shown here when it comes to creating a custom phone case. Your options are endless when it comes to using clear phone cases. You can use favorite photos in it, your kids’ artwork, magazine pages, fabric, and more. You can even switch designs out to match your outfit, your mood, or the current holiday, since nothing is permanently attached to your iPhone or other smart phone. We hope you like the ideas you’ve found here. Make sure to let us know how your project went and share this great project with friends too!